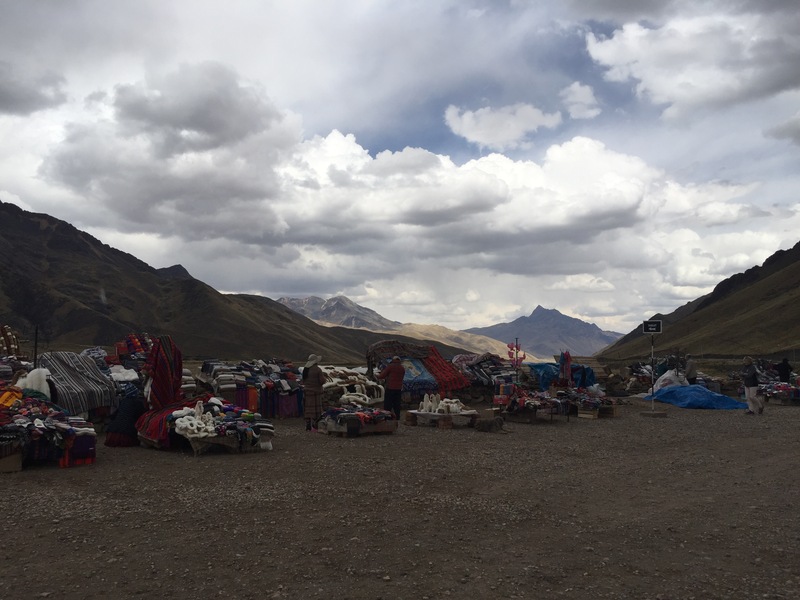 After our arduous hike over the last 4 days, today would take us from Cusco to Puno by private van plus guide. Glenn, Gwen, Dan and I had our breakfast at the hotel and said our goodbyes to Jessica (one of my rocks throughout the Inca Trail). Shortly after 7:30 our Guide, Carlos, arrived and led us to the van. It was very luxurious with room enough for each of us to have our own bench seat if we wanted! 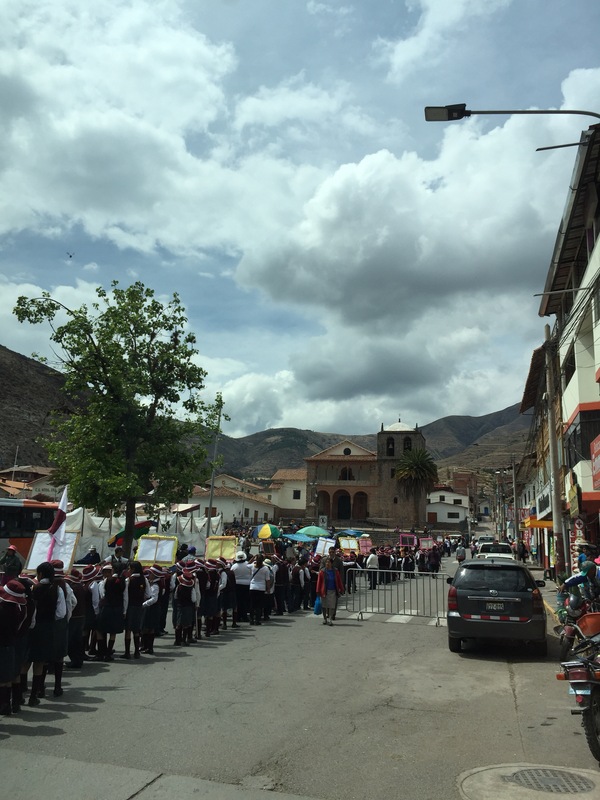 Our first task was to get out of the old city centre of Cusco at rush hour, As it turns out their were 2 drivers plus our guide ( the drive was to be about 10 hours with stops), so the resting driver got out and directed traffic in these skinny ancient streets so that the van could do a three point turn. Never a dull moment! 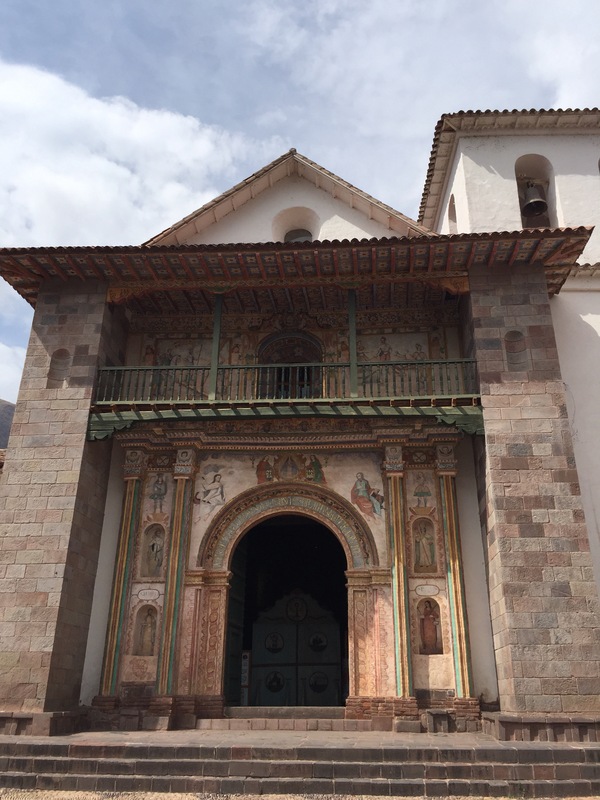 Once we got turned around we headed out of town and onto our first stop was the Church of San Pedro of Andahuaylillas. 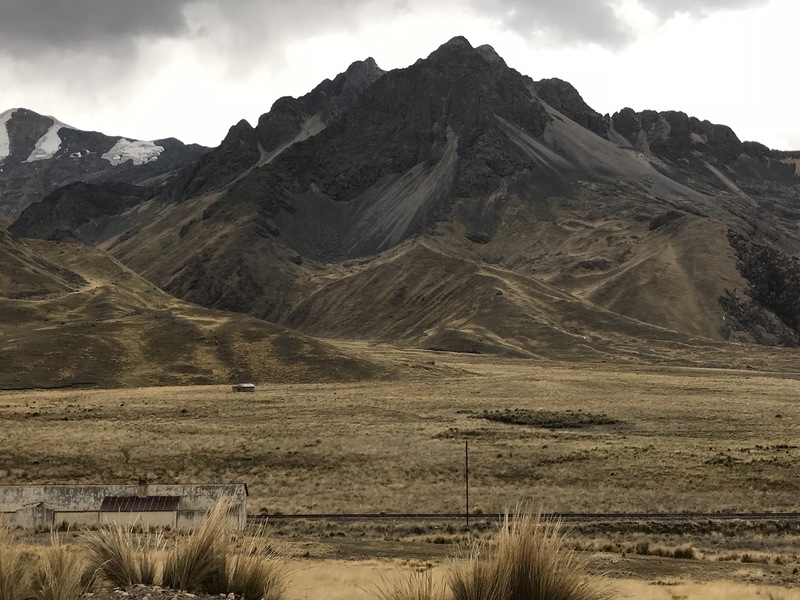 This church called the Sistine Chapel of South America ( bit of a stretch) was a prime example of how the Spanish convinced the Incan people to come out of hiding in the hills and learn new skills and reap the “benefits” of their new religion. 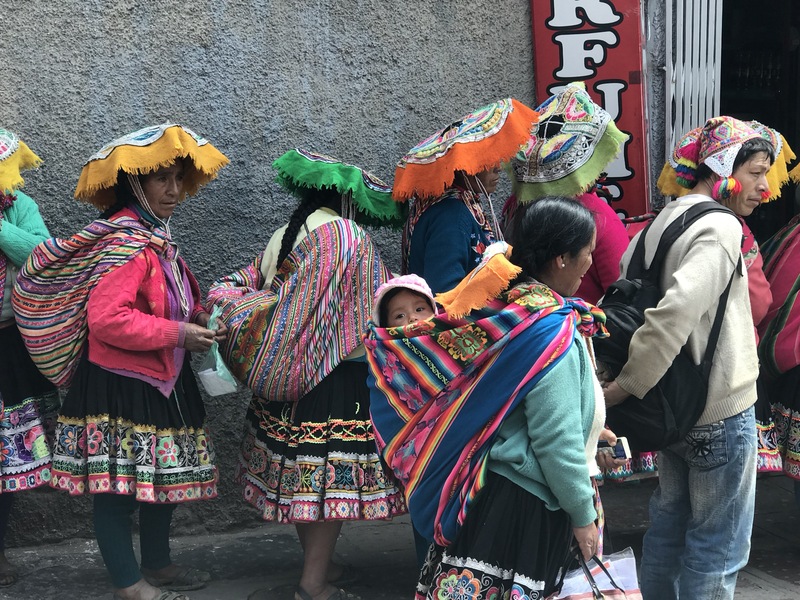 The depictions were amazing… how Mary’s robe always formed an inverted “V” shape reminding the Incas of their mountain god…how Mary’s and others wore radiating crowns of gold, reminding the Incas of their sun god etc. All in all quite interesting. 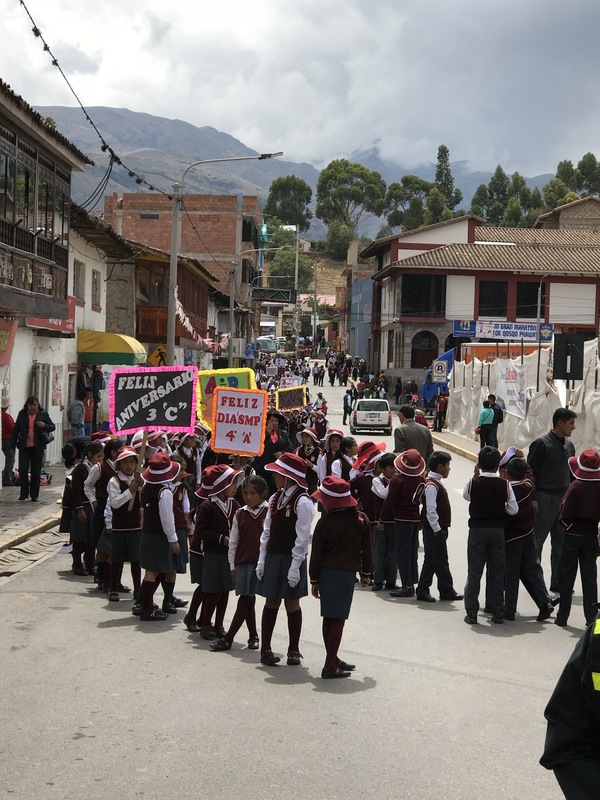 Our drive took us through all the small towns and villages and at one point we were stopped with a parade of school children making their way to the town square… the whole school, walking down the main drag on Monday morning stopping traffic in all directions. Our trusty spare driver came the the rescue and was finally able to direct a path for us to get through! 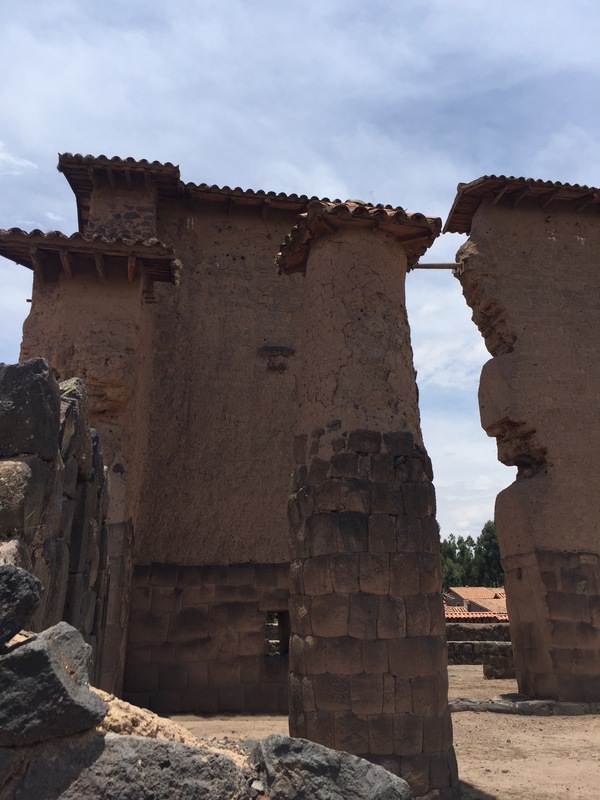 Back in the car we went, and this time to an amazing Incan ruin at Raqchi. Here we saw the remains of over 100 storage towers, used to store food of various types. The way they were constructed, and then layered with a mint like hers kept them good for up to ten years without rot or pestilence. Then on to see the temple of the god of nobility…an amazing structure with perfect alignment to the sun in the summer solstice. 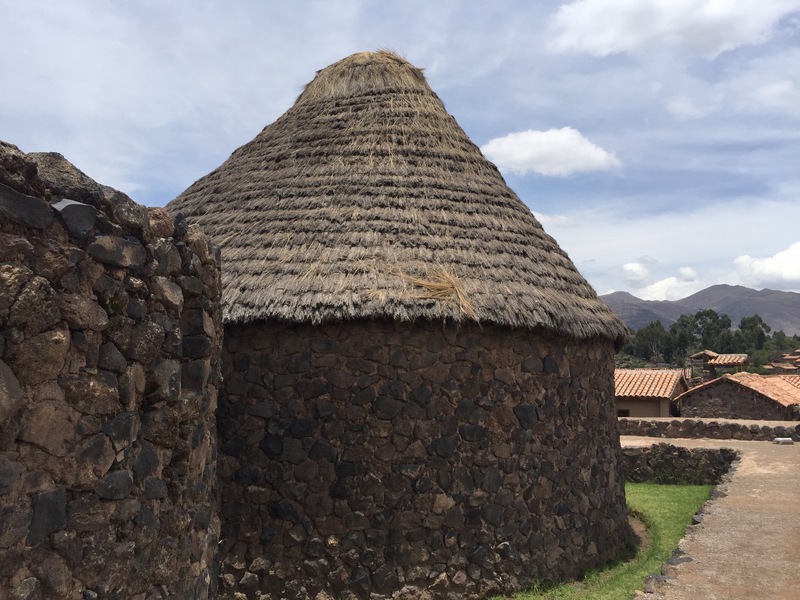 I have not seen an Incan structure this height before, nor with clay roof tiles. 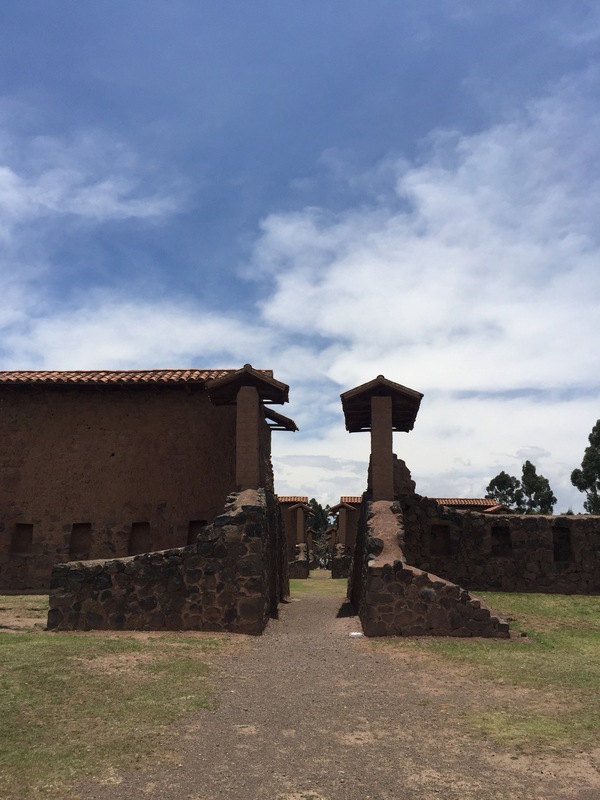 Note the alignment of the corridor between the structures…It is in perfect alignment with the sun on the summer solstice. 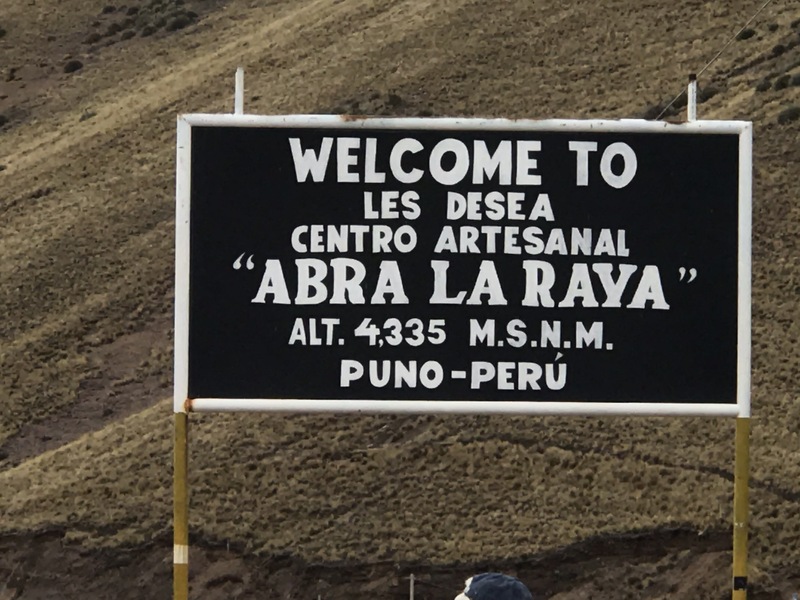 On we went to our lunch stop, and then to the highest point of our drive, the Abra La Raya pass at over 4300 m.
On the other side of the pass, the topography changed dramatically from lush fertile valley to the alto plano or the high plane of the Sierra. 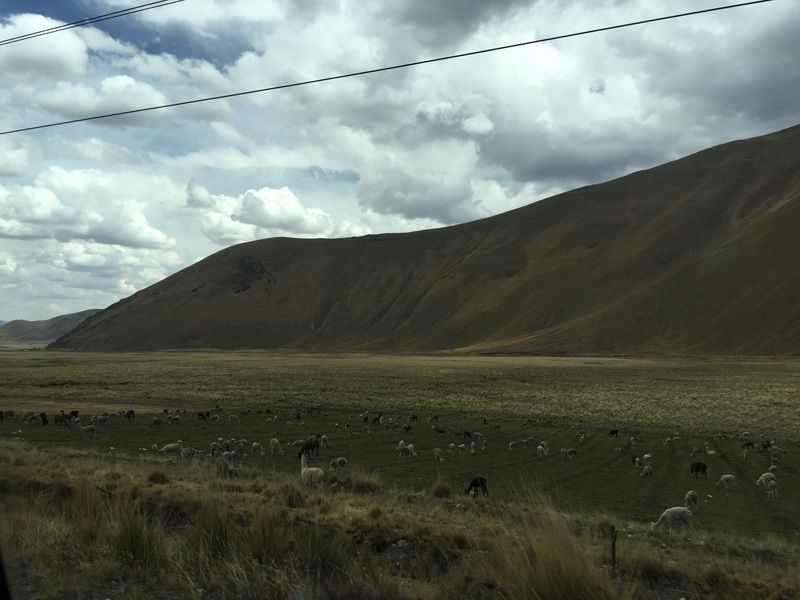 Here the plane widened and we saw a lot of scrub grass (favourite grazing of llamas and alpacas) and herds of the animals themselves. Enroute to Puno we went through the town of Juliana where the airport is that we will be using to fly back to Lima in a few days. What a chaotic mess! Roads under construction and half finished, buildings under construction everywhere… and you guessed it, traffic was responding in its usual chaotic way…quite fascinating to watch actually! BUT, we certainly need to take this under consideration in our travel times getting back to the airport. 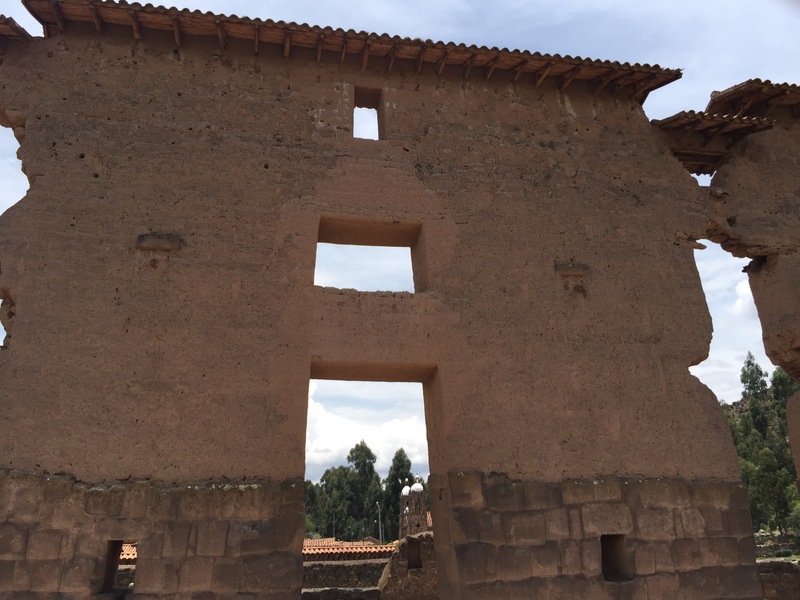 We finally arrived in Puno and checked into our hotel – a lovely room. After we checked in, we had a call that our tour guide for the next 2 days would meet us in the lobby and give us a briefing of our lake tour and home stay and then we were off to find dinner! I actually tried Alpaca grilled tenderloin and it was delicious ( not unlike veal). Well it had been a long day so we all took to our rooms to get ready for our next adventure and get a good night’s sleep! 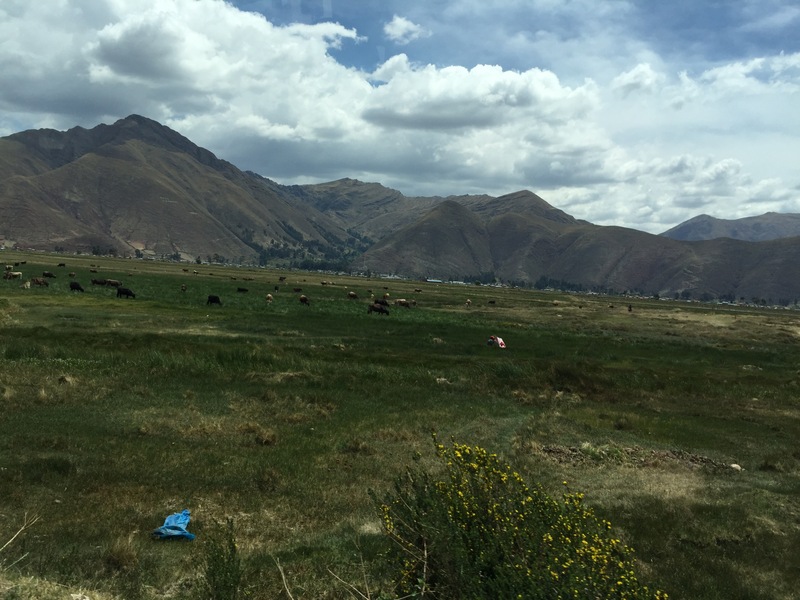 (Btw, my sleep was interrupted much of the night with a desire for oxygen….guess I’d better find more of those coca chews if I want to get any sleep over the next night at altitude!). I never knew sleeping at 3,827 meters could be so challenging. The fact that you nasal passages dry up in this arid climate doesn’t help matters either! Oh well, I get to come here and enjoy! Love the pics. 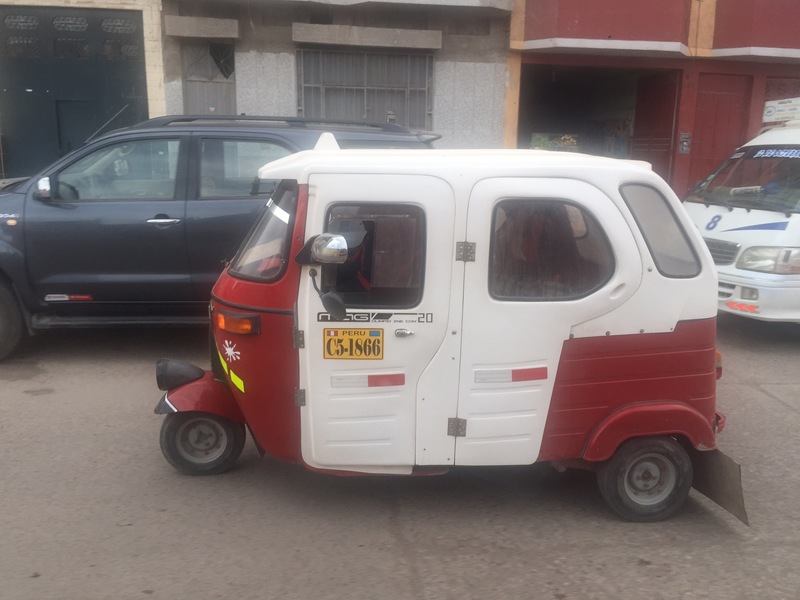 Many unique things that vary from our own travels in the region. Yes, but was sorry not to bill able to fit in the rainbow mountains, nor the Attacama, but some different and interesting experiences!